Kimberly McCullough’s first gig, came at the age of six, in the cult classic Breakin’ 2: Electric Boogaloo, as a featured break-dancer. 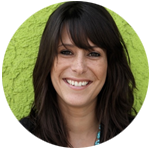 In August of 1985, she originated the role of Robin Scorpio on the daytime soap opera, General Hospital during which time she spent many hours in the “booth” with the producers, writers, and editors. In 1996, Kimberly left General Hospital to attend NYU Film School and went on to write and direct two short films: Life After and Lil Star. In June 2010, Kimberly participated in the AFI Directing Workshop for Women where she wrote/directed the dark comedy, Nice Guys Finish Last. The short film won the AFI Nancy Malone award. In 2012 Kimberly was accepted into the Disney/ABC Talent Development for Directors (2012-2014) during which she directed her first episode of television on the hit Disney Channel show, Shake it Up! In 2015 Kimberly directed an episode of Pretty Little Liars (ABC Family) and KC Undercover (Disney Channel). Her feature film, Broken Heart, MO. is currently in development at Radar Pictures (starring Kathryn Prescott and Jenna Elfman). Recently, Kimberly wrote/directed Hey Day, a pilot presentation about the debaucherous, behind the scenes world of soaps in the early 80’s.